Veterans remember their fallen comrades during a past ceremony at Scranton Cemetery. File photo. 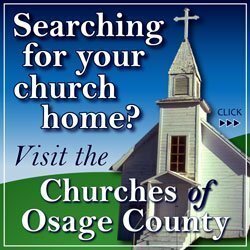 In remembrance of those who have given their sacrifices, local veterans organizations will lead ceremonies and honor guards at cemeteries around Osage County this weekend. Lyndon American Legion Post 125 will hold honor guard ceremonies at the following times and cemeteries on Memorial Day, Monday, May 28, 2018: 10 a.m. at Lyndon Cemetery; 10:30 a.m. at Vassar Cemetery; 11 a.m. at Pomona Lake Dam; and 11:30 a.m. at Oak Hill Cemetery, Quenemo. The Pomona Dam ceremony is conducted by posts from Osage City, Melvern and Lyndon. 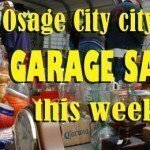 Osage City American Legion Post 198 will host the Memorial Weekend Pancake Feed 6:30-10 a.m. Saturday, May 26, at the Legion hall in Osage City. 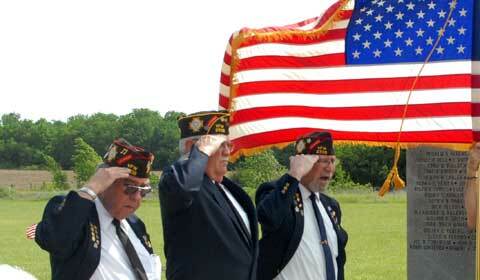 In addition, the post will man the Avenue of Flags at the Osage City Cemetery Sunday and Monday. The flags will be raised and lowered as follows: Sunday, May 27, flags up at 7 a.m., flags down at 7 p.m.; Memorial Day, Monday, May 28, flags up at 7 a.m., flags down at 5 p.m. Flags are folded at the Legion hall after taking them down on Monday. Volunteers are always welcome and needed. 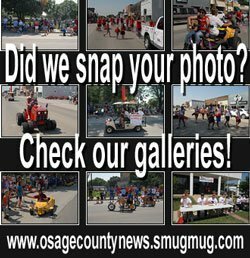 The post will conduct memorial services at 10 a.m. Monday, May 28, at the Osage City Cemetery, and then travel to Pomona Dam for the ceremony there at 11 a.m.
At Overbrook, Memorial Day weekend includes family fun and traditions. At Overbrook Cemetery, friends and neighbors will help set up the Avenue of Flags, starting at 7 a.m. Saturday, May 26. At 12:30 p.m. Sunday, May 27, the Overbrook American Legionnaires pay honor to departed and fallen veterans with the annual “Laying of the Wreath” service. At Scranton Cemetery, Scranton VFW members will conduct a memorial ceremony at 11 a.m. on Memorial Day, May 28. The public is invited to any of the ceremonies. Updated May 26, 2018, to include Scranton Cemetery ceremony.